1. To assemble and freeze, place all of the ingredients in Bag 1 in one resealable bag and close. Place chops in a second bag. Place both bags in a third bag, close and label. This can remain frozen for up to 2 months. 2. To defrost, place in fridge 2 days before preparing. 3. To prepare, season pork chops with the salt and pepper. Heat oil in a large non-stick skillet. Cook chops about 4 minutes on each side. 4. 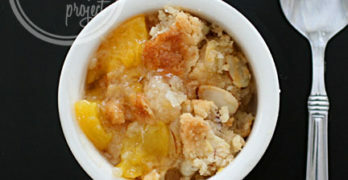 Remove 1/4 cup of liquid from the peach mixture and set aside. Add the remaining contents of Bag 1 to the skillet with the chops and bring to a boil. Reduce heat to medium-low and simmer about 3 minutes. 5. Mix the cornstarch into the reserved liquid and add to the pan, stirring an additional minute to thicken the sauce. 6. Serve with rice pilaf and steamed green beans or broccoli. Peach Glazed Pork Chops Recipe release as usual is top class that could be served on a very popular restaurants and five stars hotel.This recipe is good for the health of the elder ones. I like to try it at home. Love this recipe. fixed it last night and kids raved about it.